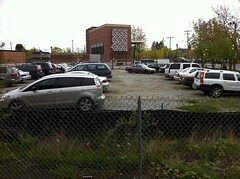 Cars parked at El Centro de la Raza on Beacon Hill. Photo by Wendi. The Seattle Department of Transportation is currently surveying the opinions of both business owners and customers about parking. How do you decide where to park? What are your needs if you are a business owner? How can the parking situation be made better? Fill out a survey here. The survey should take about 10-15 minutes to complete. A neighbor at the Beacon Hill Festival, thinking about how to prioritize Neighborhood Plan ideas. Photo by Jason. The purpose of this survey is to ask North Beacon Hill neighbors and non-residents to rate their support for elements of our 2011 Neighborhood Plan update. In the survey, you are asked to indicate your level of support or agreement for various strategies to be included in the plan. (Some examples of the strategies that are included in the survey: “Create affordable rental and home ownership housing targets for the Beacon Hill Urban Village and periodically evaluate progress,” and “Create the Town Center campus on Beacon Avenue between McClellan and 15th, by calming and redirecting traffic flow, extending the festival street, and creating bus/bike lanes and activated alleys.”) The proposed plan update will be edited based on your input. Questions or comments? Send them to nbhcplan@gmail.com. 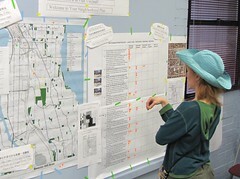 This plan update is proposed by neighborhood volunteers, with ideas that come from neighborhood groups and individuals. It incorporates the work done by the Seattle Department of Planning and Development (DPD) in 2009 and the comments they collected. Look for future reports on the survey results here on the Beacon Hill Blog. The 1999 North Beacon Hill Neighborhood Plan has been a highly successful document because neighbors and City of Seattle departments implemented significant improvements for our community over the ten-year planning period. It was built on the shoulders of the 1993 North Beacon Hill Action Plan, our first neighborhood plan and one of the first residential neighborhood plans in the City. The 1993 Action Plan was supported by extensive study of housing trends, demographics, and conditions in the North Beacon Hill neighborhood. Update: The survey form has been updated. See below for the links to the new questionnaire. They need responses by noon on Sunday, November 29th. Thanks for sending along the new form and revised due date, Chris! If you’re involved with El Centro de la Raza at all, you know that we’ve been working for a few years on finalizing plans to develop the South end of our property (directly across from the Light Rail Station along Lander St.). We are extremely excited because now that the Light Rail is up and running, it won’t be too long before we get to develop the property and make our beloved Beacon Hill even better! Our vision for the space includes a large multi-purpose/event building, underground parking, low-income housing, an open space/plaza, as well as retail/office/business space. We are currently working with the Business and Economic Development Center (BEDC) at the University of Washington’s Foster School of Business to assess what kind of retail/office/business space will be best for the Beacon Hill community. And of course, in order to figure that out we need your input! Students from the BEDC will be at Red Apple this weekend with a questionnaire they developed regarding what kind of development you, as Beacon Hill residents, would like to see on that piece of property, so valuable now that the Light Rail has moved in – small, independent stores? Chain restaurants? More grocery options? Better parking? If you’d like to fill out the survey without taking a trip to Red Apple, you can download the survey in Microsoft Word format from El Centro download the revised survey in Microsoft Word format here. Because not everyone has the capability of running Microsoft Word, we have made an HTML version and Google Docs version available if you find working with those formats in your web browser easier. (I hope this does not cause a hardship for the survey talliers.) These links have been updated to reflect the new survey above. — Ed. Please email your completed surveys to Ming Huang, President of the Asian Business Student Association, at huangmingf@yahoo.com. Ms. Huang and her colleagues will compile them and send the results to El Centro anonymously. Mr. Jones emphasized that they are committed to developing the El Centro property in the community’s best interest. If you have any questions, you can contact Elliott Jones at (206) 957-4652. 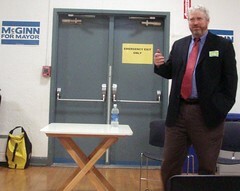 Mike McGinn at a town hall meeting on Beacon Hill last month. Photo by melissajonas. Will these match the final numbers? Time will tell. At least two people attempted to stuff the ballot box by voting repeatedly (and obviously). Any votes that were the result of such ballot-box stuffing were removed from the final total. This left us with fewer than 100 responses, so it is a very small sample. It’s taken us longer to compile results from last month’s Top of the Hill survey than we expected. There are still a bunch more results coming, but since absentee ballots for the upcoming election are landing in everyone’s mailboxes this week, we wanted to get one of the results out to you sooner, rather than later. Mike McGinn had a huge lead on Beacon Hill with 53% of the vote, followed by Joe Mallahan with 15%. 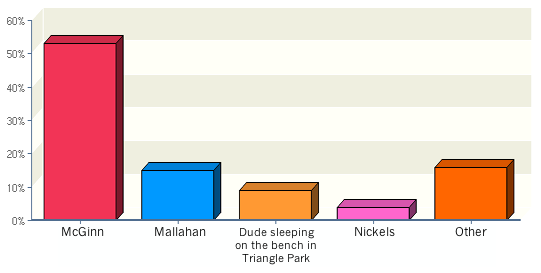 “That dude sleeping on the bench in Triangle Park” had a relatively strong showing, with 9%. (For the first week of the survey, the anonymous Triangle Park guy was actually leading the race.) 6% of the “Other” responses were “I don’t know.” Current Mayor Greg Nickels had 6% of the survey responses (the chart does not show this correctly). The survey closed on September 11, so your opinions might have changed, or not. What do you think now? We’ve posted a new survey to find out what you currently think. Beacon Hill folks only, please. The next group of results in the Beacon Hill Blog Top of the Hill are about the things we want, the reasons we live here, and the reasons why some might consider leaving Beacon Hill. Previous results are here, and there will be more results soon — stay tuned. 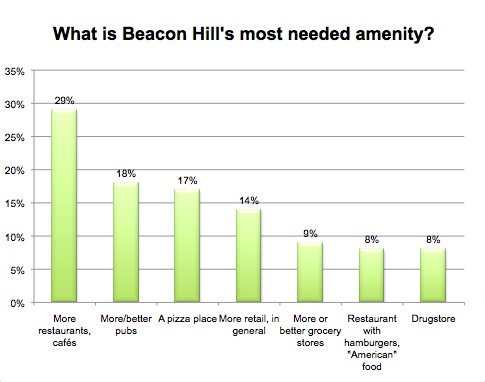 What do you think is Beacon Hill’s most-needed amenity? We asked for one answer here, but some people listed as many as 17 different amenities! It seems that, for the most part, Beaconites have food on their minds. The most popular answer was “More restaurants/cafés/coffee shops“, given by 29% of those surveyed. 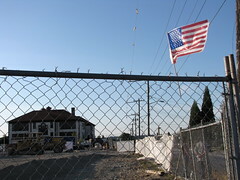 It was followed by requests for two specific kinds of establishments that people would like to see more of: a pub/brewpub/gastropub (a few people specifically mentioned Columbia City Ale House or West Seattle’s Beveridge Place Pub as the type of establishment they’d like to see here), mentioned by 18%, and a pizza restaurant, mentioned by 17%. Beacon Hill once had a drugstore or two, and 8% of you think that a drugstore is our current most-needed amenity. 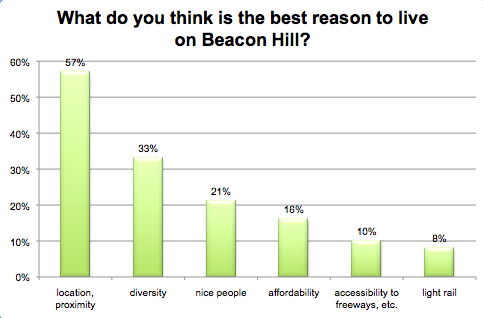 16% mentioned the affordability of living on Beacon Hill, and 8% specifically mentioned the new light rail. 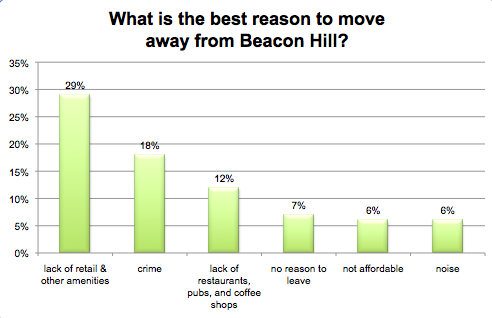 On the other hand… what is the best reason to move away from Beacon Hill? Lack of retail and other amenities in our business district was the reason selected by 29%. One-third of people who gave this answer (10% of the overall total) explicitly stated that they wanted those amenities to be walkable. 12% of you specifically referred to a lack of restaurants, pubs, or coffee shops. Crime is a concern mentioned by 18% of you. 6% mentioned decreasing affordability, and another 6% mentioned noise (almost entirely airplane noise, but one person mentioned light rail noise as well). The next batch of results in the Beacon Hill Blog Top of the Hill reader survey are about food and fun on the hill. We’ll be bringing the rest of the survey results to you periodically over the next few days. Previous results are here. 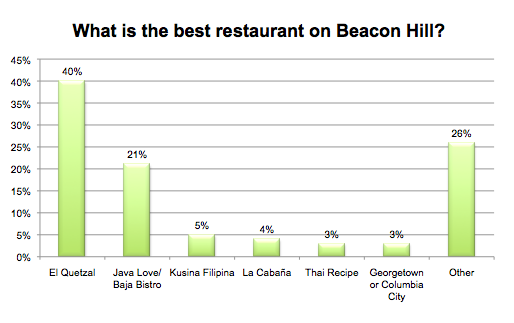 What is the best restaurant on Beacon Hill? We knew El Quetzal was well-liked but didn’t expect it to be as much as an overwhelming favorite as it was. Apparently lots of us are fans of their tortas and huaraches: 40% of respondents selected the tiny Mexican restaurant on Beacon Avenue as the best restaurant on the Hill. 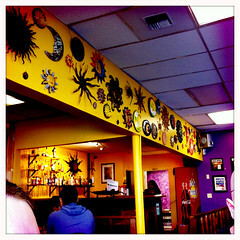 Its closest competition was the Java Love/Baja Bistro combo, with 21%. A few other restaurants were mentioned multiple times, including Kusina Filipina (5%), La Cabaña (4%), Thai Recipe (3%, and just barely qualifying as Beacon Hill, since it’s almost at the bottom of McClellan — but we’ll take what we can get), and Inay’s (2%). The award for most misspelled restaurant on Beacon Hill goes to Kusina Filipina. Survey respondents spelled it: “Kuisina Filipina,” “Cusina Fillipina,” “Cucina Philippina,” “Kusina Flilipina,” and “the Filopina kitchen next door that I can not spell.” Only one person spelled it right. 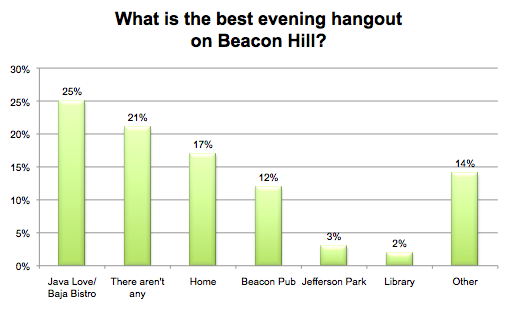 What is the best evening hangout on Beacon Hill? All right, we admit that this is one of the questions we asked hoping that our readers would tell us about some potential places to go in the evenings that we don’t already know about. Unfortunately, the pickings are still a little slim up here. The first Beacon Hill Blog Top of the Hill reader survey closed last week. We’ll be bringing the results to you periodically over the next week or so. Here’s the first part of the results. Where do you live on Beacon Hill? We did know that we had more readers in North Beacon than any other part of the hill, but were surprised to see how many more. 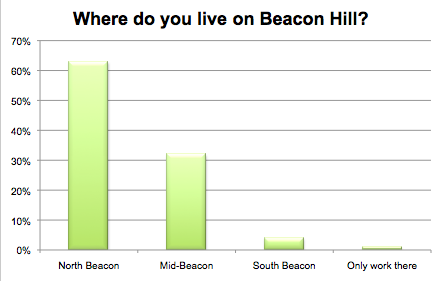 63% of survey respondents live on North Beacon Hill, 32% on Mid-Beacon, and only 4% on South Beacon. North Beacon is probably slightly denser than the rest of the hill, but not so much that we’d expect that sort of difference. 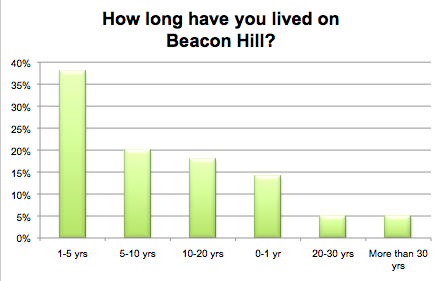 How long have you lived on Beacon Hill? This answer surprised us a great deal, though perhaps it should not have. The leading answer by a mile, was 1-5 years, chosen by 38% of respondents. It was followed by 5-10 years (20%), 10-20 years (18%), 0-1 year (14%), 20-30 years (5%) and more than 30 years (also 5%). Particularly interesting here is that this indicates that 52% of us — at least, of those of us who read the BHB and fill out surveys — have been here for five years or less. As the disclaimer in the last sentence indicates, however, we are well aware of the statistical limitations of our survey. Does it represent all of Beacon Hill well? Probably not. We probably should have taken more demographic info, to get a better idea who might be answering the survey. Still, it does seem likely that Beacon Hill has a lot of newcomers these days.